Let’s start with an interesting fact, in the last three days spot silver has gained more than it achieved in an entire 5 year period from 1999 to the end of 2004, a scary fact and one which we we would do well to ponder. In the last four days spot silver has gained over $3.50 per ounce, in other words 12% which if replicated throughout the year would equate to 1200%!! Not a bad return. In this morning’s trading session we have seen spot silver break through the $28 per ounce level to trade at time of writing at $28.45. From a technical perspective the outlook remains firmly bullish with silver also benefitting from a pull through from gold which itself is being propelled higher by talk of a move towards some sort of gold standard for paper based currencies. 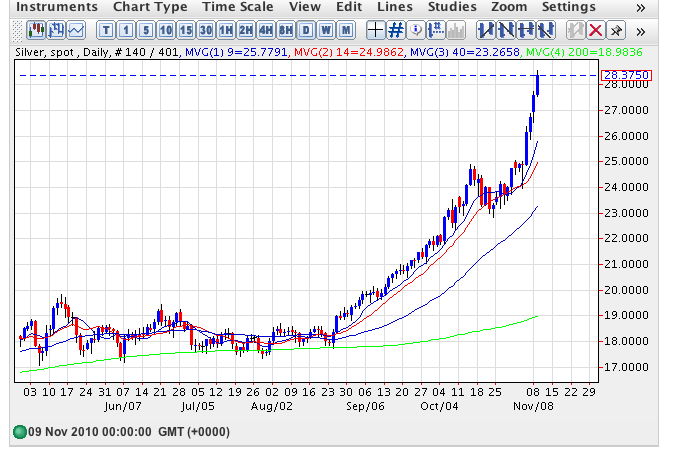 Whilst this is unlikely, it is nevertheless all adding to the bullish picture for these precious metals.